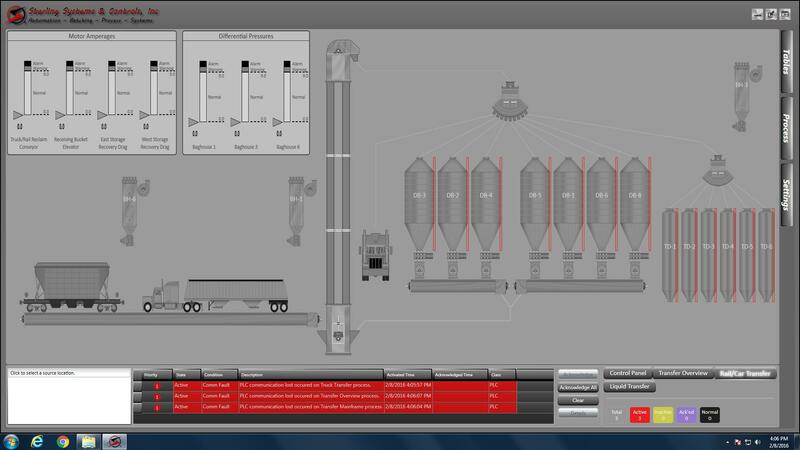 The grain terminal automated control system utilizes rack mounted PC’s running Sterling Systems customized Windows based Automation Software using a SQL express database. The PC’s are connected to an Allen Bradley PLC. The PLC provides I/O interface to field devices. 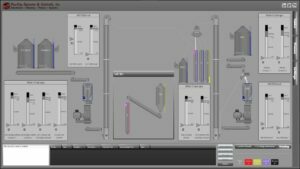 Any manual controls are done within the Sterling Systems customized control software. All components used are non-proprietary and available from local suppliers. Any grain transfer is first initiated by selecting the source and destination locations. When selecting, a yellow border surrounds the device and the message center at the lower left hand corner will update indication which are selected. After the source and destination are selected the operator clicks on the Control Panel and presses Start. This starts the equipment automatically. By selecting the specific transfer that is currently running and then pressing the Stop button will sequentially shutdown the selected running process and equipment. By pressing the Abort button to either immediately shutdown the running process or all processes without a sequential shutdown. A graphical screen will display the transfer process. Status messages, alarms, and function of the process are displayed. The equipment shown is representative of the equipment controlled.The screens are very dynamic in that all the equipment shown change shades to identify the various status conditions. Each alarm condition is logged. This grain terminal includes a grinding process. The grinding screen shows the roller mills and surrounding equipment. When the equipment or vessel is on or active the graphic will go from dark grey to bright white. If an alarm exists on any equipment, a red square surrounds the device with a pulsating red triangle. Each ingredient bin for the batching system also included in this grain terminal for feed milling purposes shows calculated level as a narrow bargraph and they are color coded as well. The color is determined by the level setpoints and bin inventory in the Bin Assignment table. The bargraph will be blue if the level is above the warning setpoint, yellow if between the warning and low setpoint, and red if below the low setpoint. No matter what the grain terminal consists of or requires, Sterling Systems & Controls can control it and automate it for you to increase productivity and profitability.